About the Midwest’s “pioneer quilt” of flowers and grass. How fire renews the prairie. A tallgrass prairie is a magical mixture of distance, vastness, movement, and surprise that can only be discovered when you are out in the midst of it. Before the pioneers came, this huge ecosystem stretched over four hundred thousand square miles from Canada to Texas and from Indiana across what is now Kansas. An early traveler crossing the tallgrass prairie of western Minnesota had to stand on his horse’s saddle to see his way. 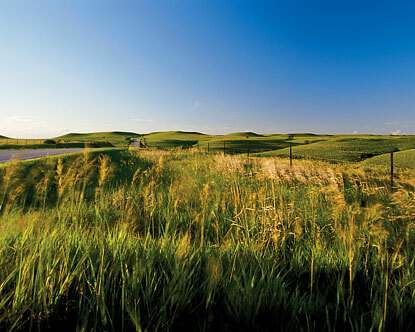 Farther west, on the drier Great Plains, is the shortgrass prairie, which extends all the way to the Rocky Mountains. Much of the shortgrass prairie is still relatively intact. But the tallgrass—the king of prairies—has become the corn belt. All but a tiny fraction of this once vast ecosystem was plowed under by the pioneers. What is a tallgrass prairie? It’s hundreds of different species of grasses and plants that can grow as tall as ten feet. Grasses such as Big Bluestem and Indiangrass bend and sway in a breeze, and the entire landscape can appear like the billowing waves of an ocean. Prairie grasses have extensive root systems that allow them to grow through long, hot, dry summers. Unlike trees, which grow from the tips of their branches, grass grows from the root. It sends out rhizomes, or runners, beneath the soil to form new plants. These roots bind the earth into thick mats of sod, which soak up water like sponges and retard evaporation. Sometimes huge summer thunderstorms build up over the land. When lightning strikes the dry grasses, it can start a fire. Before the pioneers came, prairie fires regularly swept over the land destroying any tree seedling that had taken root. Because grass is propagated underneath the soil, it is not harmed by fire. Burning also releases nutrients that grasses need to grow. Today prairie land managers start controlled burns to clear away the mat of tangled vegetation and make way for new growth. Ecosystems that many people think of as dull and monotonous, like prairies and marshes, are merely subtle. A prairie ecosystem is a complex community of plants and animals that will fascinate anyone who gives it a closer look. Don’t just view a prairie from your car. Instead, join a ranger-guided walk out into the grasslands. The ranger will show you how to find burrows that might be home to a prairie mouse. If you pass near a patch of sumac, you might find a coyote den. 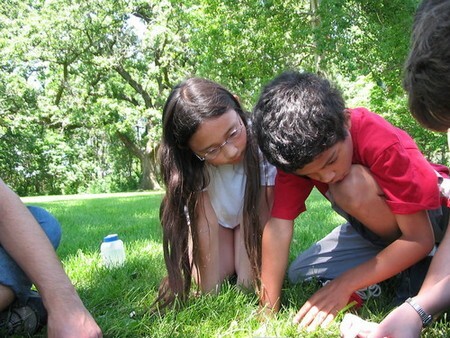 You will learn how to identify animal tracks and birdsongs and flowers. On your own prairie walk, you can practice looking far and near. Look up. You might see a hawk in the sky. Look at a hillside. You might see cloud shadows racing over the surface of the grass. Bring your binoculars and your magnifying glass along. They will extend the range of the unaided eye and help you discover the magic world hidden in a subtle landscape. While you are in the prairie, always stay on established trails where you can see the ground. Tall grass can conceal rocks, holes, snakes, and ticks. If you visit the prairie when there’s a cold wind blowing, you might become chilled. If the grass and soil are dry, stop and lie down. Tall grass makes an excellent windbreak. If you visit the prairie in spring, you may find the pasque flower barely poking through the mat of dead grass. Because it’s so short, the pasque flower must bloom before the prairie grasses grow too tall. Later-blooming flowers, like coneflowers and spiderworts, are tall enough to keep their heads above the grass, where insects can pollinate them. Although you will find prairie wildflowers from early spring through autumn, there are two peak seasons: late spring (mid-May to mid-June) and again in late summer (August-September). This is when you can witness a brilliant carpet of flowers as far as the eye can see. When most children think of birds they think of trees. Where do birds live on a prairie where there’s nothing even faintly resembling a tree? Either they live in burrows, like burrowing owls, or they nest on the ground, like horned larks. We are all used to hearing the songs of birds perched high in a tree. Where do prairie birds sing if there isn’t a branch to sit on? In the air, of course. If you visit the prairie in late March through April, listen for the booming call of male prairie chickens as they take on their rivals in ritual combat. You might even get to see them performing their spectacular mating dance. Throughout the spring and summer you can’t miss the sweet, lilting tune of the meadowlark, for it is one of the loudest of the songsters. Early morning and late evening are the best times to see birds, as well as other animals. You might discover their tracks along a stream. The popular name for the symbol of the Old West is the buffalo, although the proper name is the North American bison. Whatever you call them, these huge animals are unpredictable. They can run fast and jump great distances. When you are hiking on the prairie, keep at least one hundred yards between you and a grazing herd (the length of a football field). View them through binoculars. How to tell a buffalo’s mood? If his tail is hanging loosely, he’s peaceful. A slightly raised tail means he’s alert. If it’s held straight out, then he’s excited about something. A raised tail is telling you to keep your distance; this bull is in a combative mood and may be ready to charge. The only way to view buffalo in complete safety is from your car. In a preserve, the animals think they own the road, so you may encounter a buffalo roadblock. This is an opportunity to quietly pull off onto the shoulder and observe. Many wild animals are less likely to be spooked by cars than by people on foot. Wildlife photographers take advantage of this and get some great shots from the windows of their vehicles. Tallgrass Prairie Preserve, Oklahoma. In 1989 the Nature Conservancy purchased a thirty-thousand-acre cattle ranch in north central Oklahoma and is now well on its way toward recreating a functioning tallgrass prairie ecosystem using fire and bison. Stop and see the historic ranch headquarters and bunk house. Then follow self-guided nature trails out into the prairie. Can you locate the preserve’s free-ranging herd of bison? They can cover a lot of ground in a day as they munch their way along. With each spring’s new calves, the herd grows. Eventually it will reach eighteen hundred, the optimum number for a prairie this size. The preserve is open dawn to dusk (no overnight camping). Free admittance. Information: Tallgrass Prairie Preserve, The Nature Conservancy, P.O. Box 458, Pawhuska, OK 74056, (918) 287-4803. Prairie State Park, Missouri. Although most prairie soil is very deep, this two-thousand-acre tract was too rocky to plow. Until the park was established, it was used for grazing and haying. Because the sod was never broken by a plow, it is known as virgin prairie. The state park has more than ten miles of trails and a full-time naturalist on staff. Backcountry camping is available. Check in at the visitor center—depending on where the bison are, certain trails may be closed at various times. Information: (417) 843-6711. Theodore Roosevelt National Park, North Dakota. As out-of-the-mainstream as North Dakota seems to many Americans, this fascinating state was one of the major well-springs of America’s conservation ethic, a philosophy that created the diverse system of national parks, forests, wetlands, and wildlife preserves that we enjoy today. It was in North Dakota’s Badlands and shortgrass prairies that Theodore Roosevelt, our first environmental president, developed the disciplined mind and turbulent spirit that would propel him to the White House. Long after he returned to the East, he acknowledged, “I have always said I would not have been President had it not been for my experience in North Dakota.” Today he is memorialized in one of our most beautiful—and one of our least visited—national parks, and the only one named after a president. The legend of Teddy Roosevelt has interest for children of all ages. The story is told that he first came to the Badlands in 1883 to hunt big game. What he found was that the great herds of buffalo had been slaughtered and other big game species decimated. When he refused to shoot a terrorized bear cub, the story made its way around the world. What followed was the birth of the teddy bear. Do your children know that teddy bears were named after President Roosevelt? The first one, which now resides at the Smithsonian Institution, was fashioned in 1902. They’ve been growing in numbers ever since and have become cherished members of millions of families. Elementary school kids are fascinated by Roosevelt as cowboy. During the years he was in North Dakota, he ran cattle on the open range, learned to rope and ride, crack a bullwhip, and become a crack shot. You can visit the original log cabin from his Maltese Cross Ranch, and imagine you’re Rough Riders by signing on for an overnight trail ride. Teenagers, many of whom are developing their own environmental ethic, will be interested to know that President Roosevelt established the U.S. Forest Service and created the National Wildlife Refuge System by signing an Executive Order to protect the birds of Pelican Island, Florida. He also established five national parks, eighteen national monuments, and a total of fifty-five wildlife refuges. Do they know that Roosevelt was instrumental in saving the American bison from extinction? The Badlands are an odd landscape—the hills aren’t high enough for mountains, the valleys not deep enough to be labeled canyons. And yet they appear as untamed and desolate today as they were when Roosevelt arrived in the last wild place in the West. It’s wonderful country for backpacking. You’ll find total solitude less than a mile from your car on a variety of trails. Walk through a petrified forest, pass by prairie dog towns, and pause at a point overlooking the Little Missouri River. Late afternoon sun is the best time to appreciate the rich colors of the Badlands. Deep green vegetation is accented by blue bentonite, black lignite coal seams, reddish caprock, and reddish-brown scoria—where a seam of coal once burned and baked the earth into a kind of natural brick. Backcountry cautions: Underground fires continue to smolder in some places. Don’t feed the prairie dogs—they bite and can carry plague. Buffalo must be respected. Ask the ranger to suggest a good backpacking trail that’s suitable for your children’s ages. Information: Superintendent, Theodore Roosevelt National Park, Medora, ND 58645, (701)6234466.